The other day I came across a nail art design Lala Vasquez was rocking and decided to give it a try. 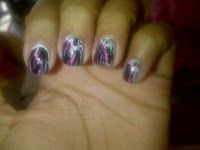 It's rather simple: 2 colors of polish topped with crackle. I used E.L.F. 's Lilac and Blue Mist as my base coats, topped with China Glaze Crackle, and used Essie "Good to Go" as my top coat. This is a super quick design to rock, but I probably won't have it on for more than a few days. My nails are growing like weeds and at this length it's nearly impossible to have a manicure last.